There are a whole range of arthritis in knee treatment, but the one most consistently found to make a difference is exercises. Whilst exercises won't cure the knee arthritis, they can be extremely effective in reducing pain and increasing function, making a huge difference to daily life. They can even help delay the need for surgery. If the knee is strong and flexible, less weight goes through the arthritic knee and there is less pain and wear through the joint. Here we will concentrate on advanced, challenging exercises for arthritis. If you haven’t already tried the strengthening, movement and balance exercises, I suggest you start there. Once you have mastered those and feel in need of more challenging exercises, these are the ones for you. 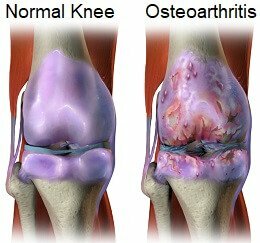 You can also find out more about other arthritis in knee treatment options including injections, homeopathy and medication in the arthritis treatment section. For effective arthritis in knee treatment, exercises should be done at least five times per week. Here you will find a daily exercise plan that means you split the exercises into groups rather than having to do them all at the same time. This way, each set will take you less than five minutes, making it much more manageable to fit into busy days. If you haven't already seen them, I suggest you have a look at the strengthening exercises and movement and balance exercise pages for more really helpful arthritis in knee treatment ideas. Please tailor this to suit you – some exercises may be too easy or too difficult for you and therefore not appropriate. Find what works for you. The people who have the most success are those who stick with their exercise programmes. For information see the Getting The Best Results from arthritis in knee treatment section. If you would prefer to only do exercises twice a day, combine the AM and late morning set, and the afternoon and evening set. Exercises are just one part of arthritis in knee treatment. There are a number of other things that can really help including knee braces, acupuncture, natural remedies and changing your diet for arthritis. For more information including symptoms, diagnosis and other arthritis in knee treatment options, check out the Arthritis overview.